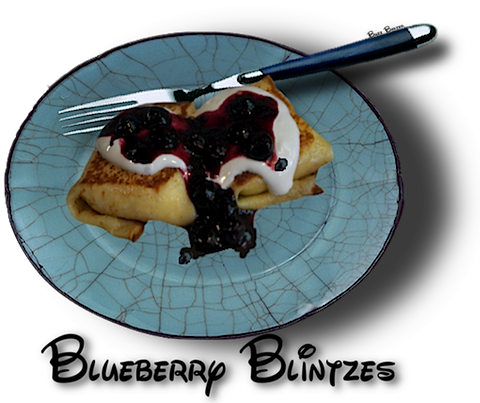 Blintzes are Jewish almost to a tradition. Feel free to alter the toppings for this delicious recipe. 1. Mix above ingredients together and spread on cooked side of crepe. 2. Overlap sides and ends. Brown briefly. Top with thick Greek style yogurt. 1. Place the sugar, cornstarch, salt, and water in a medium sized saucepan and stir until smooth. 2. Stir in the blueberries and place the saucepan over medium heat. 4. Taste to see if more sugar is needed and add more water if you want a thinner sauce. 5. Stir in the vanilla extract, if using, and the lemon zest and juice. 6. Taste and add more lemon juice if needed. 7. Let cool and then cover and refrigerate. 1. Mix all together. Beat until smooth with a whisk. Let stand 2 hours in refrigerator. 2. Heat small skillet to 350℉. Add 2 teaspoons oil in skillet. Heat. 3. Pour ½ batter in. Tip pan to spread batter. 4. Cook 1 minute. Jerk pan to loosen. Turn over, cook ½ minute. 6. Cook second half of batter. 1. Roll fruit in them. 2. Add cinnamon and powdered sugar on them. 3. Top with whipped cream.